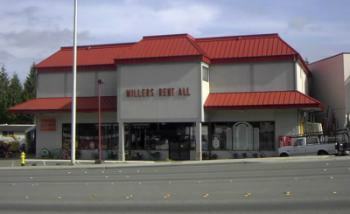 At Millers Equipment & Rent-All, we specialize in homeowner equipment rentals as well as contractor equipment and party rentals. We are a leading equipment rental center for Lynnwood WA, Shoreline, Bothell, Edmonds WA, Mountlake Terrace WA, Everett and the Seattle Metro areas. Our experienced staff is comfortable helping customers select canopies, china, and dance floor for weddings and other events, as well as selecting the right telescoping boom lift and chain saw for a landscaping project. Our party rental inventory ranges from chocolate fountains to air walk bounce houses and from margarita machines to popcorn and hot dog machines. We have enough chairs, tables and flatware to handle intimate family gatherings or community events. Our equipment rental inventory is also quite diverse, including outdoor power equipment such as Stihl chainsaws, brushcutters, blowers and trimmers. Thatchers, aerators and tillers are also very popular during the spring and summer. And we can’t forget our larger equipment such as bobcats, backhoes large and small, and several sizes of trackhoes and boom lifts.